This protocol describes the use of the chronic contractile activity model of exercise to observe stimulation-induced skeletal muscle adaptations in the rat hindlimb. Kim, Y., Memme, J. M., Hood, D. A. Application of Chronic Stimulation to Study Contractile Activity-induced Rat Skeletal Muscle Phenotypic Adaptations. J. Vis. Exp. (131), e56827, doi:10.3791/56827 (2018). Skeletal muscle is a highly adaptable tissue, as its biochemical and physiological properties are greatly altered in response to chronic exercise. To investigate the underlying mechanisms that bring about various muscle adaptations, a number of exercise protocols such as treadmill, wheel running, and swimming exercise have been used in the animal studies. However, these exercise models require a long period of time to achieve muscle adaptations, which may be also regulated by humoral or neurological factors, thus limiting their applications in studying the muscle-specific contraction-induced adaptations. Indirect low frequency stimulation (10 Hz) to induce chronic contractile activity (CCA) has been used as an alternative model for exercise training, as it can successfully lead to muscle mitochondrial adaptations within 7 days, independent of systemic factors. This paper details the surgical techniques required to apply the treatment of CCA to the skeletal muscle of rats, for widespread application in future studies. Skeletal muscle can adapt to exercise training through changes in its bioenergetics and physical structure1. One of the major alterations brought about by endurance training is mitochondrial biogenesis, which can be evaluated by an increase in the expression of mitochondrial components (e.g., cytochrome c oxidase [COX] subunits), as well as the expression of the transcriptional coactivator, PGC-1α2. A growing number of studies have indicated that numerous other factors, including mitochondrial turnover and mitophagy, are also important for muscle adaptations. However, the mechanisms by which acute or chronic exercise regulate these processes in skeletal muscle are still unclear. To delineate the pathways which regulate exercise-induced muscle adaptations, various exercise models have been commonly used in rodent studies, including treadmill, running wheel, and swimming exercise. However, these protocols have some limitations in that ~4 - 12 weeks are needed to observe these phenotypic changes3,4,5. As an alternative experimental method, low-frequency stimulation-induced chronic contractile activity (CCA) has been effectively used, as it can lead to muscle adaptations in a substantially shorter period (i.e., up to 7 days) and its effects appear to be comparable to, or even greater than other exercise protocols. Furthermore, the presence of hormonal6, temperature7, and neurological effects8 may make it difficult to understand muscle-specific responses to chronic exercise. For example, thyroid hormone9,10 and insulin-like growth factor (IGF)-111 have been identified to mediate training-induced muscle adaptations, which may also regulate other signaling pathways in skeletal muscle. Notably, CCA-induced effects are minimally regulated by systemic factors, allowing focus to be placed on the direct response of skeletal muscle to contractile activity. The external unit for CCA was first introduced by Tyler and Wright12, and has been developed with modifications12. 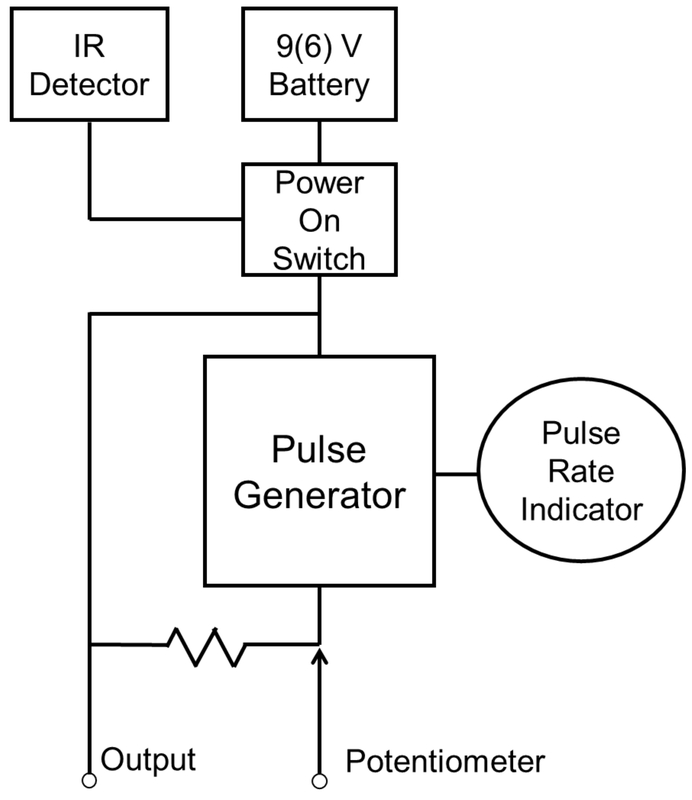 In short, the unit is composed of three main parts: an infrared detector that can be turned on and off by exposure to infrared light, a pulse generator, and a pulse indicator (Figure 1). The detailed circuit design of the stimulator unit has been described previously13. The detailed and specific features of CCA can be found in greater depth in a number of review articles14,15,16,17. In brief, the stimulation protocol is designed to activate the common peroneal nerve at low frequency (i.e., 10 Hz), and the innervated muscles (tibialis anterior [TA] and extensor digitorum longus [EDL] muscle) are forced to contract for a predetermined length of time (e.g., 3 - 6 h). Over time, this shifts the aforementioned muscles to a more aerobic phenotype, demonstrated by an increase in both capillary density18 and mitochondrial content19,20,21. Thus, this method is a proven model to mimic some of the major endurance training adaptations within skeletal muscle of rats. This paper presents a detailed procedure of the electrode implantation surgery to induce CCA so that the researchers can apply this model in their exercise studies. CCA is an excellent model for studying the time course of muscle adaptations, thus providing an effective tool for the investigation of various molecular and signaling events at both early and later time points following the onset of exercise training. All animal-related procedures were reviewed and approved by the York University Animal Care Committee. Upon arrival at the animal facility at York University, all rats were given a minimum of five days to acclimatize to their environment prior to the surgical procedure, with food provided ad libitum. Although this protocol has been previously applied to other species15,17,22, the current paper builds on the pioneering work of Pette and colleagues23 and focuses on the rat model, specifically. Using a voltmeter, check the potential of the coin lithium batteries. NOTE: The potential of each battery should be 3.0 ± 0.10 V.
Insert two or three batteries into the slot of the unit so that the total potential is 6 - 9 V.
NOTE: It is up to the discretion of the researchers to consider how much potential (6 or 9 V) to maintain during the whole experimental procedure. Depending on the study design, and the desired intensity of the stimulus, either 2 or 3 batteries can be used. Verify that the unit is working properly via the pulse indicator, by exposing the unit to 1 pulse emitted by a portable infrared strobe light. NOTE: Sterilize all surgical tools before the surgical procedure. Both during and immediately after the surgery, the body temperature of the rats is maintained by a heating pad. It is desirable to perform the surgical procedure on a surgical drape. The surgeon should wear sterile surgical gloves as well as a clean lab coat. If needed, it is recommended to wear a disposable respirator mask. Anesthetize rats under 1 - 3% isoflurane inhalation with oxygen, which is operated by a gas vaporizer system. Confirm animal is fully sedated by checking hindlimb toe pinch and by observing respiratory depth and rate. Apply ocular lubricant on eyes to avoid dryness. Apply a subcutaneous injection of Meloxicam (0.5 mg/mL) at 2 mg/kg. NOTE: It is also recommended to have a multi-modal application of analgesia (e.g., Meloxicam plus lidocaine) to minimize any pain during and after the surgery. Gently shave the left hindlimb, as well as a strip around the torso from the back of the neck, around behind of the forelimbs and across the anterior thorax. Gently wipe shaved areas with iodine and ethyl alcohol to disinfect. With the animal laying on its stomach, make a small incision (~0.5 cm) on the back of the neck in the center of the shaved region (the palpable area between shoulder blades) using a scalpel (No. 10 blade). Locate the common peroneal nerve. Roll animal onto its right side and make a ~2 - 3 cm-long cut in the skin of the left hindlimb. Target the incision area around the upper thigh muscle groups that is landmarked between the dimple of the knee joint and the back close to the origin of the tail. NOTE: Be careful not to contaminate the first incision area when changing the position of body. Using blunt-tipped curved surgical scissors, dissect the subcutaneous area widely ~3.5 - 4 cm, separating the skin from underlying muscle in order to make a pocket between the opened skin and underlying muscle. Open the skin from underlying tissue around the entire circumference of the incision (~1.5 cm2). Make a small incision (less than 0.5 cm) on the biceps femoris muscle with surgical scissors, ensuring that the tips of the scissors are cutting directly down through the muscle. Gently open the cut area until the internal muscle groups and the common peroneal nerve are visible (the depth of external muscle tissues (i.e., biceps femoris) is around ~0.5 cm). Using forceps, gently touch/pinch the visible nerve and observe responses of the target muscle groups (e.g., TA muscle) and toes (visible dorsiflexion) to confirm that the common peroneal nerve is isolated. NOTE: This step should be done with extreme caution to avoid cutting or damaging the nerve. Fix the window by pulling it open with metal retractors such that the size of the window is ~1.5 cm2 with the peroneal nerve lying in the center of the window. Use small metal hooks attached to straps and/or rubber bands that are fastened down to the table surface (or surgery board) (Figure 2A). Attach the wire to both sides of the nerve. Prepare ~50 - 60 cm of polytetrafluoroethylene (PTFE)-coated fine stainless-steel wire and fold it in half. NOTE: It may be helpful to expose PTFA-coated wire under the UV light before the surgery. Hook the folded part of the wire into the slit of a 30 cm-long stainless-steel rod. Pass the rod, along with the wire, subcutaneously from the open pocket of the hindlimb towards the small incision area at the back of the neck, in an L-shape pattern up the leg and along the center of the back. Find the two ends of the wire at the hindlimb. Strip the wires since all wires are PTFE-insulated. Using a scalpel, carefully strip the ends of the wire by ~1.5 cm. If the wires become frayed, cut them out and re-strip. Wrap the stripped wire ends around a blunted 21-G needle (5 times), making a coil. Once the coils are properly made, release the needle from them. Using a size 6-0 surgical silk, secure each of the coils on either side of the common peroneal nerve (Figure 2A). Make a knot at the very end of the coil, and suture it on the left-hand side of the nerve. Ensure that the coil is at 1.5 - 2.5 mm from the nerve. To secure the coil, apply two or three additional sutures along the coil. Repeat these steps on the right-hand side of the nerve. Apply 2 - 3 drops of antibiotic solution (ampicillin in saline; 132 mg/mL), and then carefully suture the window (i.e., biceps femoris muscle tissue) using size 5-0 silk. Loosely wind the remaining slack of wire (about the diameter of the index finger) and push into the subcutaneous pocket above the sutured incision of the biceps femoris muscle (approximately above the hip). Apply 2 - 3 drops of antibiotic solution again (ampicillin in saline; 132 mg/mL). Close the opened skin by stapling. Connect the wires (coming out of the incision area of the neck) to the CCA stimulator. Connect pin sockets with the wires. Cut the wire loop coming out of the incision at the top of the neck to create 2 wire ends (these lead to the coils sutured to either side of the peroneal nerve). Using a scalpel, strip off the ends of the wires by ~0.5 cm. Cut off frayed wires, if any. Slowly push the stripped parts of the wires into the hole of the pin sockets, and using a soldering iron, solder the wires on the pin sockets. Optionally, check the connection of wires. Connect the pins to a large benchtop stimulator unit via alligator clips. Deliver a single pulse of 9 V (0.1 ms, 10 Hz) to confirm that TA muscle contracts and the left foot dorsiflexes. Pass the pin connected-wire ends through the sterile gauze pad that is ~4 cm x 4 cm. Connect the pins to the CCA stimulator unit. Pass the wires through the hole in the base of the stimulator box. NOTE: This box is a home-made chamber for the CCA stimulator unit and is 3.5 cm × 3.5 cm × 2.5 cm13. Insert the pins into the connection sockets on the CCA unit. Gently put the CCA unit into the chamber. Use a sticky tack to secure the CCA unit at the bottom of the chamber. Using an athletic tape or the porous surgical tape, fix the chamber with tape around the shaved torso. Close the top of the chamber with three layers of taping and finish by wrapping a tape around the sides of the stimulator box to secure the box (Figure 2B). Check if the CCA is working by exposing the unit to a single pulse of infrared light (wavelength spectrum >770 nm) that is emitted by a portable infrared strobe light. NOTE: If the CCA is properly working, researchers will be able to see the hindlimb muscles (i.e., TA) are contracting in response to the infrared light. Observe the rat and monitor its temperature until it has fully regained consciousness. House it in a single-occupant cage to prevent any harm from other animals and do not leave any tunnels or plastic objects in the cage for the remainder of the study to mitigate the risk of damage to the stimulator unit or injury to the animal. Supply with an Amoxicillin-included water bottle (0.5 mg/mL). Apply 1 mg/kg dose of Meloxicam subcutaneously every 24 h following the surgery, which continues at least for 72 h.
After the surgery, allow at least 5 - 7 days for a full recovery of incision and suture areas in/around the skeletal muscles. NOTE: During and after CCA procedure, thoroughly check each animal's condition by observing their behaviors (e.g., eating, drinking, and/or moving). In addition, determine any severe stress or adverse effects by checking a change of body weight before and after the CCA procedure. On the day of CCA stimulation, turn on CCA by exposing the stimulator unit to a single pulse of infrared light (wavelength range >770 nm) by a portable infrared strobe light. Apply 3 or 6 h of 10 Hz CCA stimulation. NOTE: The time frame for stimulation is up to the researcher. The frequency of stimulation has never been altered in these experiments and only very modest enhancements in the mitochondrial adaptation have been observed by extending the stimulation from 3 to 6 h/day, in our experience. If possible, check the stimulation and animal every 30 - 60 min. Following the desired CCA period, turn off the CCA unit via infrared light exposure (same procedure as turning on the unit). If applying multiple days, repeat the step 3.2. to 3.4. Determine the timing of tissue collection. For example, collect tissues 24 h after the onset of the final bout of CCA (i.e., 18 h after the last CCA stimulation of 6 h), which is conducted under the anesthesia as done during the CCA surgical procedure. Immediately after collecting all tissues, euthanize animals by excising the heart while the animal is still under anesthetic. We have shown that chronic contractile activity (CCA) is an effective tool to induce favorable mitochondrial adaptations within skeletal muscle. Rats subjected to 7 days of CCA (6 h per day) display enhanced mitochondrial biogenesis in the stimulated muscle as compared to the unstimulated contralateral (control) hindlimb. This increase in mitochondrial biogenesis is indicated by increased protein expression of PGC-1α (Figure 3A), considered the master regulator of mitochondrial biogenesis, along with elevations of other key mitochondrial proteins COX-I and COX-IV, which are important components of the electron transport chain. Moreover, Cytochrome c Oxidase (COX) enzyme activity, a useful indicator of mitochondrial content, increased approximately 30% following 7 days of CCA (Figure 3B). In addition, we assessed changes in mitochondrial function using permeabilized muscle fibers to measure mitochondrial respiratory capacity and found that CCA resulted in an increase in the maximal respiratory (i.e., state 3) capacity of muscle subjected to 7 days of stimulation relative to control muscle (Figure 3C). Furthermore, both mitochondrial populations, subsarcolemmal (SS) and intermyofibrillar (IMF), increased following 7 days of CCA (Figure 4A and B), and we found the IMF fractions from muscle subjected to 7 days of contractile activity to be observably more red in color than those derived from the control (CON) muscle using differential centrifugation, presumably indicating higher levels of myoglobin, heme, and other oxygen-related elements (Figure 4C). Adaptations to the autophagy and lysosomal systems can also be brought about by CCA. In particular, we have observed an increase in the protein abundance of transcription factor EB (TFEB; Figure 5A), the principal regulator of lysosomal biogenesis, by CCA at all time points (i.e., 1, 3, and 7 days), as well as other lysosomal markers such as lysosomal-associated membrane protein 1 (LAMP1; Figure 5B). Interestingly, our study has shown that alterations to the autophagy, mitophagy and lysosomal systems occur prior to mitochondrial biogenesis. Figure 1. A schematic diagram shows major components of a portable CCA stimulator unit. This Figure has been modified from Takahashi et al.13. IR, infrared. Please click here to view a larger version of this figure. Figure 2. Electrode and stimulator implantation. (A) A window for connecting wires at both sides of common peroneal nerve. (B) An exemplary image for demonstrating an assembly of CCA unit. Please click here to view a larger version of this figure. Figure 3. PGC-1alpha, mitochondrial respiration and enzyme activity with CCA. (A) CCA induces mitochondrial adaptations in skeletal muscle, as shown by increases in protein levels of PGC-1α. A representative blot image is shown along with ß-Actin as the loading control. CON refers to Control, i.e., contralateral hindlimb not subjected to CCA, and fold change data was obtained by normalizing results relative to CON at Day 1. (B) COX activity and (C) permeabilized muscle respirations were also increased following 7 days of CCA. All data is shown as Mean ± SEM (N = 6-8). †P <0.05, interaction effect between CCA and time; §P <0.05, main effect of CCA; *P <0.05, significant difference vs. control at Day 1. Figure 3A and 3B have been modified from Kim and Hood19. Please click here to view a larger version of this figure. Figure 4. Evidence of mitochondrial biogenesis in muscle with CCA. (A and B) Electron microscopic images indicate enlarged volumes of both subsarcolemmal (SS) and intermyofibrillar (IMF) mitochondria in skeletal muscle of rats exposed to CCA for 7 days. This image has been modified from Ljubicic et al.21, and scale bars indicate 1 µm. 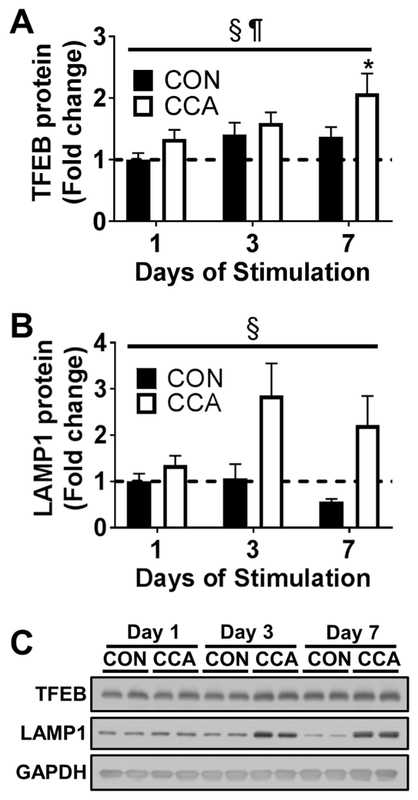 (C) A comparison of muscle mitochondrial fractionations between control (CON) and stimulated (CCA) muscle after 7 days of CCA stimulation. Please click here to view a larger version of this figure. Figure 5. The lysosomal system is upregulated by 7 days of CCA. This is indicated by increase in protein abundances in both (A) TFEB and (B) LAMP1. Results are shown as fold changes by normalizing data relative to CON at Day 1. (C) Representative blot images are shown and GAPDH is a loading control. §P < 0.05, main effect of CCA. All data is shown as Mean ± SEM (N = 8); ¶P < 0.05, main effect of time; *P < 0.05, significant difference vs. control (CON) at Day 1. This figure has been modified from Kim and Hood19. Please click here to view a larger version of this figure. The chronic contractile activity (CCA) model of exercise, through low-frequency muscle stimulation in vivo, is an excellent model for studying muscle phenotypic adaptations to exercise13,24,25,26. As shown in previous studies20,27, CCA is an effective tool by which researchers can control training volumes and frequencies (i.e., time and days) and investigate various biochemical and/or molecular events over the course of repeated bouts of contractile activity. One of the best features of this model is that muscles of the contralateral hindlimb are used as an internal control, which helps to minimize variability between animals. Furthermore, our numerous experiments over a decade have shown that the external CCA unit does not limit an animal's ordinary behavioral patterns (e.g., roaming, eating, and sleeping), and allows for the use of additional experimental treatments such as drug injections. Thus, researchers can apply the CCA protocol in their training studies with their own experimental modifications. This CCA protocol has several critical steps, although all steps may demand a high-level concentration due to a nature of survival surgery. It is especially important to connect wires at consistent locations, and it is highly recommended to have the same skillful researcher perform the surgery to maintain consistency in landmarking the same spot of the nerve, suturing wires the same distance from the nerve, etc. In addition, it is necessary to confirm the security of the taping before and during the CCA application, because loosened or worn out tape may lead to a failure of the procedure. This CCA model has some minor limitations. Since the CCA stimulation unit is fixed by taping, some animals exhibit minor skin irritations around the taping area. This could be improved in future studies through the use of a wearable jacket that would replace the CCA chamber without taping, however, we have not had success with such jackets. Alternatively, the stimulator can be implanted in the intraperitoneal space to avoid the taping procedure28, though this procedure is more invasive. In addition, the described external stimulator unit is designed to be controlled by exposing to infrared light. However, if a unit fails to respond to infrared light, this may indicate changes in the durability or sensitivity of the unit after long-time usage. The implementation of a microchip may ultimately avoid the use of the infrared light and would allow all CCA parameters to be programmed and stored, enabling CCA to be applied in a more controlled and accurate fashion. All study designs should also consider the use of contralateral limb sham surgery to exclude any possible outcomes resulting from the surgical procedure itself. It is worthwhile to continue investigating how CCA can regulate muscle mass and phenotype following periods of chronic muscle disuse, or in the context of other muscular diseases. As shown in recent clinical studies29,30, CCA can also be applied to examine its efficacy on anabolic signaling mechanisms in aging populations. In conclusion, we encourage researchers to take advantage of using this CCA protocol in their studies, whereby they can investigate the various cellular and molecular mechanisms underlying skeletal muscle phenotypic adaptations to chronic exercise. We are grateful to Liam Tyron for his expert reading of the manuscript. This work was supported by funding from the Natural Sciences and Engineering Research Council of Canada (NSERC) to D. A. Hood. D. A. Hood is also the holder of a Canada Research Chair in Cell Physiology. Holloszy, J. O., Coyle, E. F. Adaptations of skeletal muscle to endurance exercise and their metabolic consequences. J Appl Physiol Respir Environ Exerc Physiol. 56, (4), 831-838 (1984). Hood, D. A. Invited Review: contractile activity-induced mitochondrial biogenesis in skeletal muscle. J Appl Physiol. 90, (3), 1137-1157 (2001). Fernandes, T., et al. Exercise training restores the endothelial progenitor cells number and function in hypertension: implications for angiogenesis. J Hypertens. 30, (11), 2133-2143 (2012). Chabi, B., Adhihetty, P. J., O'Leary, M. F., Menzies, K. J., Hood, D. A. Relationship between Sirt1 expression and mitochondrial proteins during conditions of chronic muscle use and disuse. J Appl Physiol. 107, (6), 1730-1735 (2009). Lessard, S. J., et al. Resistance to aerobic exercise training causes metabolic dysfunction and reveals novel exercise-regulated signaling networks. Diabetes. 62, (8), 2717-2727 (2013). Irrcher, I., Adhihetty, P. J., Sheehan, T., Joseph, A. M., Hood, D. A. PPARgamma coactivator-1alpha expression during thyroid hormone- and contractile activity-induced mitochondrial adaptations. Am J Physiol Cell Physiol. 284, (6), C1669-C1677 (2003). Tamura, Y., et al. Postexercise whole body heat stress additively enhances endurance training-induced mitochondrial adaptations in mouse skeletal muscle. Am J Physiol Regul Integr Comp Physiol. 307, (7), R931-R943 (2014). Mosole, S., et al. Long-term high-level exercise promotes muscle reinnervation with age. J Neuropathol Exp Neurol. 73, (4), 284-294 (2014). Irrcher, I., Walkinshaw, D. R., Sheehan, T. E., Hood, D. A. Thyroid hormone (T3) rapidly activates p38 and AMPK in skeletal muscle in vivo. J Appl Physiol. 104, (1), 178-185 (2008). Lesmana, R., et al. The change in thyroid hormone signaling by altered training intensity in male rat skeletal muscle. Endocr J. 63, (8), 727-738 (2016). Hokama, J. Y., Streeper, R. S., Henriksen, E. J. Voluntary exercise training enhances glucose transport in muscle stimulated by insulin-like growth factor I. J Appl Physiol. 82, (2), 508-512 (1997). Tyler, K. R., Wright, A. J. A. Light weight portable stimulators for stimulation of skeletal muscles at different frequencies and for cardiac pacing. J Physiol Lond. 307, 6-7 (1980). Takahashi, M., Rana, A., Hood, D. A. Portable electrical stimulator for use in small animals. J Appl Physiol. 74, (2), 942-945 (1993). Ljubicic, V., Adhihetty, P. J., Hood, D. A. 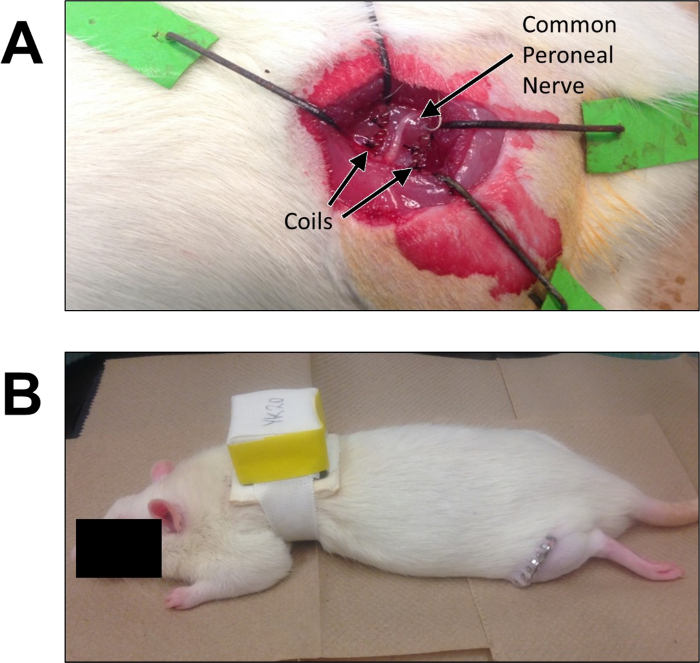 Application of animal models: chronic electrical stimulation-induced contractile activity. Can J Appl Physiol. 30, (5), 625-643 (2005). Pette, D., Vrbova, G. What does chronic electrical stimulation teach us about muscle plasticity? Muscle Nerve. 22, (6), 666-677 (1999). Pette, D. Historical Perspectives: plasticity of mammalian skeletal muscle. J Appl Physiol. 90, (3), 1119-1124 (2001). Pette, D., Vrbova, G. The Contribution of Neuromuscular Stimulation in Elucidating Muscle Plasticity Revisited. Eur J Transl Myol. 27, (1), 6368 (2017). Skorjanc, D., Jaschinski, F., Heine, G., Pette, D. Sequential increases in capillarization and mitochondrial enzymes in low-frequency-stimulated rabbit muscle. Am J Physiol. 274, (3 Pt 1), C810-C818 (1998). Kim, Y., Hood, D. A. Regulation of the autophagy system during chronic contractile activity-induced muscle adaptations. Physiol Rep. 5, (14), (2017). Memme, J. M., Oliveira, A. N., Hood, D. A. Chronology of UPR activation in skeletal muscle adaptations to chronic contractile activity. Am J Physiol Cell Physiol. 310, (11), C1024-C1036 (2016). Ljubicic, V., et al. Molecular basis for an attenuated mitochondrial adaptive plasticity in aged skeletal muscle. Aging (Albany NY). 1, (9), 818-830 (2009). Schwarz, G., Leisner, E., Pette, D. Two telestimulation systems for chronic indirect muscle stimulation in caged rabbits and mice. Pflugers Arch. 398, (2), 130-133 (1983). Simoneau, J. A., Pette, D. Species-specific effects of chronic nerve stimulation upon tibialis anterior muscle in mouse, rat, guinea pig, and rabbit. Pflugers Arch. 412, (1-2), 86-92 (1988). Ohlendieck, K., et al. Effects of chronic low-frequency stimulation on Ca2+-regulatory membrane proteins in rabbit fast muscle. Pflugers Arch. 438, (5), 700-708 (1999). Brown, M. D., Cotter, M. A., Hudlicka, O., Vrbova, G. The effects of different patterns of muscle activity on capillary density, mechanical properties and structure of slow and fast rabbit muscles. Pflugers Arch. 361, (3), 241-250 (1976). Skorjanc, D., Traub, I., Pette, D. Identical responses of fast muscle to sustained activity by low-frequency stimulation in young and aging rats. J Appl Physiol. 85, (2), 437-441 (1998). Kim, Y., Triolo, M., Hood, D. A. Impact of Aging and Exercise on Mitochondrial Quality Control in Skeletal Muscle. Oxid Med Cell Longev. 2017, 3165396 (2017). Callewaert, L., Puers, B., Sansen, W., Jarvis, J. C., Salmons, S. Programmable implantable device for investigating the adaptive response of skeletal muscle to chronic electrical stimulation. Med Biol Eng Comput. 29, (5), 548-553 (1991). Kern, H., et al. Electrical stimulation counteracts muscle decline in seniors. Front Aging Neurosci. 6, 189 (2014). Zampieri, S., et al. Physical exercise in aging human skeletal muscle increases mitochondrial calcium uniporter expression levels and affects mitochondria dynamics. Physiol Rep. 4, (24), (2016).